Cherry Mobile Flare J1s Silently Released, Priced At PHP 2499! Home / cherry mobile / mobile / news / Cherry Mobile Flare J1s Silently Released, Priced At PHP 2499! Aside from the newly announced Flare S5 series, Cherry Mobile has silently released a new variant of the popular Flare J1, the Flare J1s. What's different from the old J1 is the Cherry Mobile Flare J1s now has bigger 1 GB of RAM coming from 512 MB and loads with Android 6.0 Marshmallow OS out of the box. However, the main camera pixel size is down from 8 MP to just 5 MP. 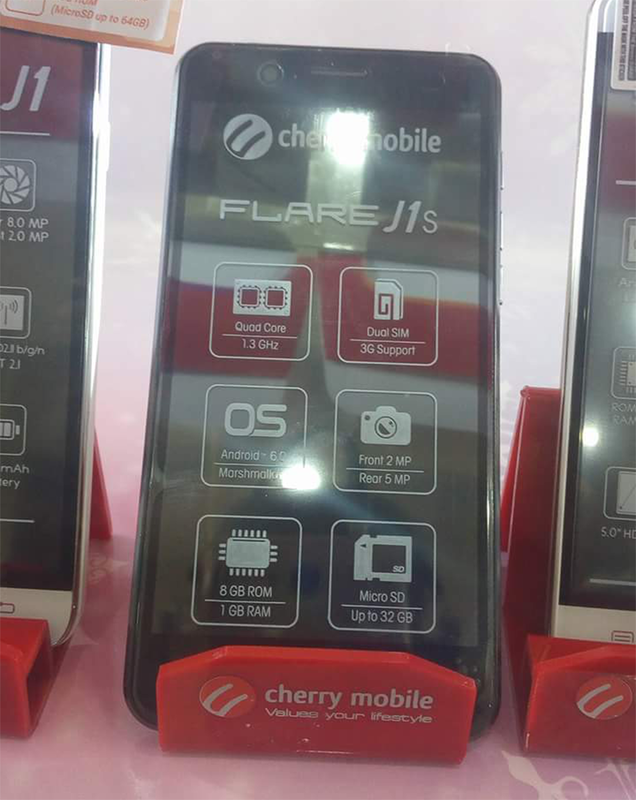 The new Cherry Mobile Flare J1s was spotted at SM Light Mall located at the City of Mandaluyong with an SRP of PHP 2,499. It'll also come with a FREE PHP 100 load upon purchase. Thanks for the tip Matthew Cuyugan!